It’s getting cold. As much as I want to hold on to summer, there’s no denying the chill in the air. Reports of snow on it’s way make me want to get cozy and enjoy comfort foods like steaming hot soup. What goes great with soup? Crackers! Bowls of delicious broth topped with buttery cheddar crackers. Yes please! 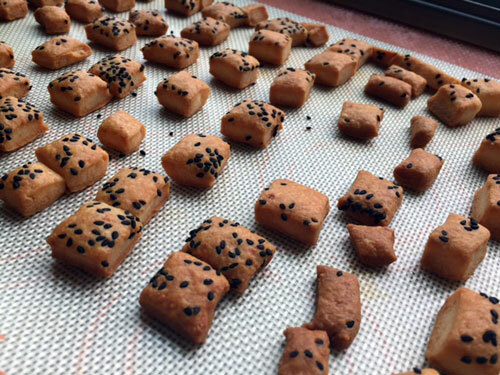 These crackers are topped with nigella seeds giving it an extra burst of flavour. 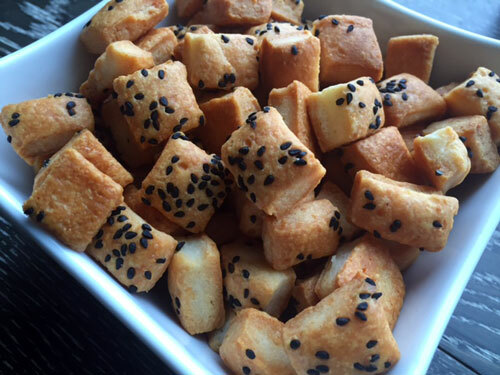 Not only are these crackers super easy to make, they are great on soup, a nice addition to any charcuterie board and they make the perfect snack! In a food processor, pulse the flour and the butter. Add the cheese and pulse again. Add the water one tablespoon at a time until the dough forms into a ball. Wrap the dough in plastic wrap and chill for half an hour. This will make the dough easy to roll. Roll the dough, sprinkle the nigella seeds and roll again. This will allow the seeds to stick right to the dough. Cut into squares, or use a cookie cutter for your desired shape. Bake at 350 degrees for 10-15 minutes. There’s not many people that I know who don’t like cheesecake. 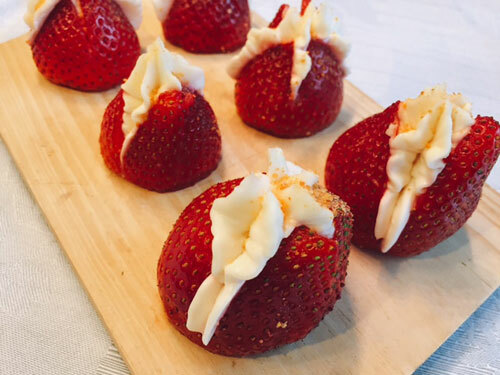 These Cheesecake Stuffed Strawberries are perfect when you feel like cheesecake but don’t feel like all the work. They are great for entertaining because they take minutes to make, leaving you with lots of time to focus on other things. The sweetened cream cheese mixture is piped into the centre of a strawberry and topped with graham cracker crumbs. All the components of a cheesecake in one bite! I prefer the idea of turning the strawberry upside down and just make a couple cuts to fill the luscious cheese mixture in. You could make a hole and scoop out the inside but why waste the delicious fruit? 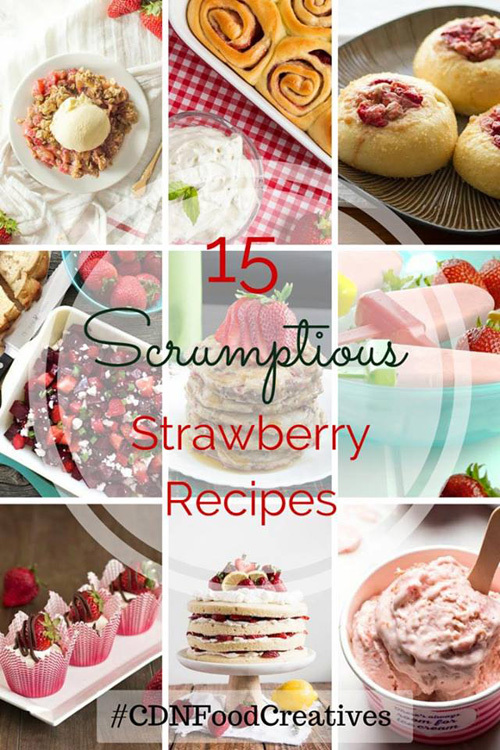 I’m excited to participate in the Canadian Food Creatives Strawberry Collaboration. Thanks so much to Amanda for hosting! 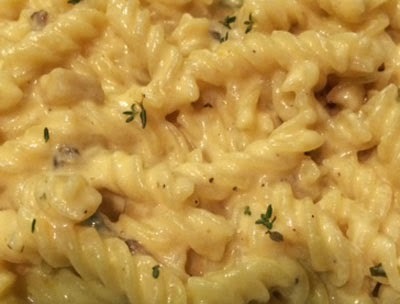 Check out all the fabulous recipes and see this recipe below. Cream the cheese, icing sugar and vanilla until combined. Put the mixture into an icing bag. Wash and dry the strawberries. From the bottom of the strawberry, make two cuts but not all the way down. 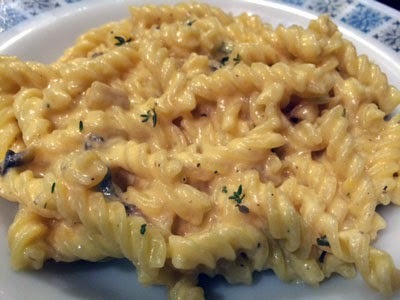 Pipe the cheese mixture into the cut, letting it fill to the top. Sprinkle the filled strawberries with the graham cracker crumbs. Puff pastry is one of those versatile things that are great to have in the freezer. It’s perfect for desserts or main courses and great for making a range of appetizers. I had people coming over and needed something to add to the charcuterie board. I was hoping for bread sticks but didn’t have any. I did have puff pastry though so cheese sticks sounded perfect. 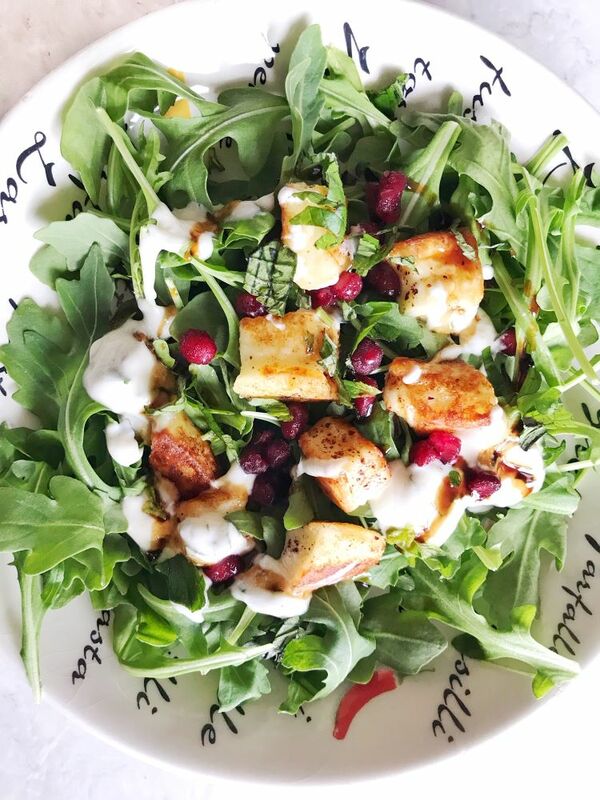 I had recently found Nigella seeds which added a burst of flavour with every bite. 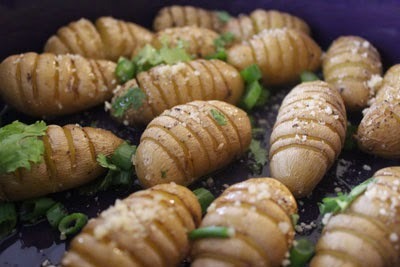 These taste great, and even more so when they are warm. Roll out the puff pastry. Sprinkle the cheese on the pastry and fold it in half. Roll it out again so that the cheese gets incorporated into the dough. Sprinkle the seeds on top of the pastry and run the rolling pin over it so that the seeds get embedded into the dough. Cut strips and place them on a parchment-lined cookie sheet, giving them a little twist. Bake at 350 degrees for 15 minutes or until golden brown. Q’s favourite cheese would have to be brie. So, when I made him responsible for a couple of appetizers at our Christmas Eve appetizer party, naturally, he wanted to make something with brie. This brie in puff pastry is so easy to make and so delicious to eat. 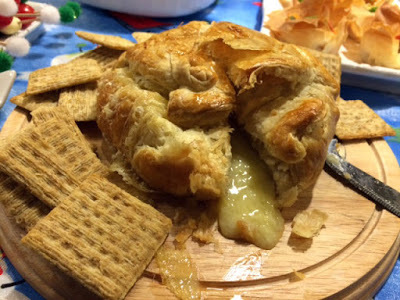 It is perfect for a party – the cheese oozing out of the pastry was a sight to see. It definitely was a winner! Place the brie in the middle of the puff pastry. Bring the edges of the pastry up so that the cheese is nicely wrapped. Brush the egg on top off the pastry. Bake on parchment at 425 degrees until golden, approximately 25 minutes. It’s Oscar Sunday! Although I haven’t seen a lot of the nominated movies, it’s a great excuse to have a party. 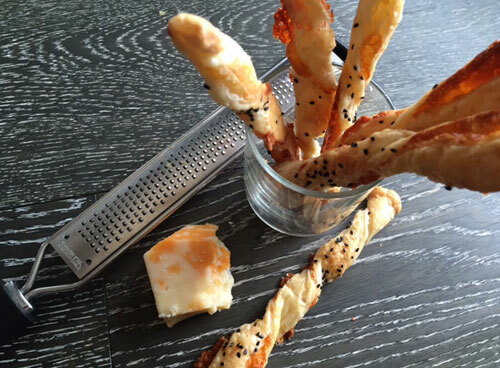 If you’re looking for an appetizer, here’s a tasty one! 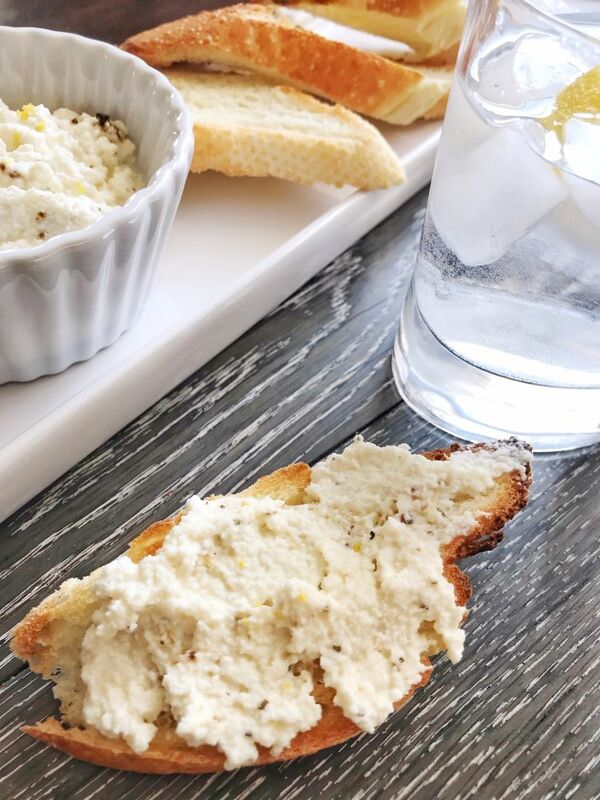 Toasted baguette rubbed with garlic topped with a refreshing ricotta spread that’s brightened with lemon and basil – yum!. 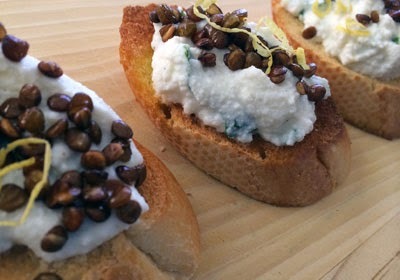 This crostini is complete with a topping of crispy lentils. The ricotta makes it nice and light while the lentils add some crunchy substance. It was hard not to eat them all myself! I became a fan of crispy lentils after trying it on a pasta dish at the Food Bloggers of Canada Conference. They are so easy to make, just tossing some cooked lentils in the oven with a little bit of olive oil. It took about 25 minutes and a couple shakes throughout the process. The crisped up lentils are great on their own but perfect as a topping. 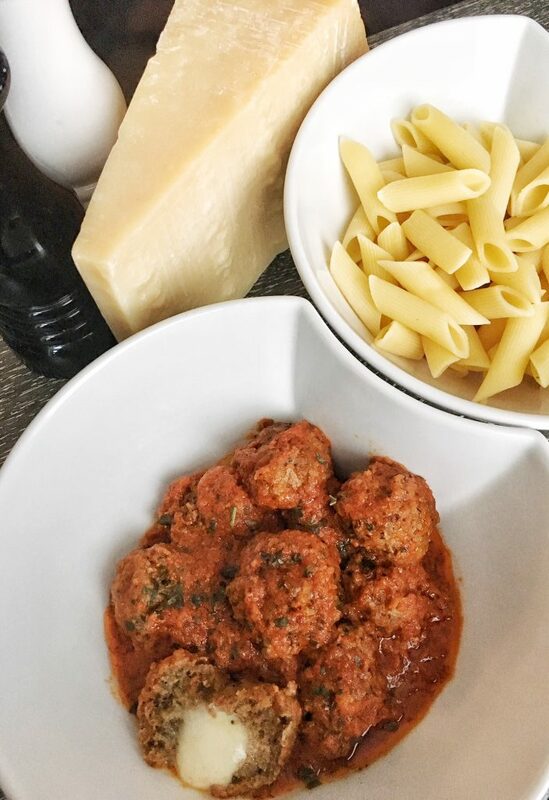 What are you serving at your Oscar party? Spread the lentils on a baking sheet with a little bit of olive oil and salt and pepper. Bake at 375 degrees for about 25 minutes. In a bowl, combine the ricotta, zest of half a lemon, juice of half a lemon and the basil. Season with salt and pepper. Cut the baguette into slices, drizzle with olive oil and toast. Add a spoonful of the mixture on the toasted bread and top with the crunchy lentils. Enjoy!